Just when life seems to be going smooth, Madison receives news that leaves her speechless. She’s a writer that for the moment cannot form her words. Rand now is the one to continue their story…his story. Rand will travel through his own journey of self discovery along the way. Just when Rand is at a high point in his life, a collapse . . . will bring one of them down…Rand? Madison? I tensed for a moment when I felt someone hovering over me. I felt a breath and caught the scent of Rand fresh from a shower. I was lying on my side and I slightly opened my eyes. I knew I was seeing him, not dreaming. I could see him getting closer and I shut my eyes, remaining so very still. He reached down, took his curved fingers down my cheek, so slowly and tenderly and then he leaned in and kissed me on the forehead. Trailing his mouth down from my forehead he placed a soft kiss on the side of my neck and then moved upward to the tip of my shoulder and he lightly bit at my cami strap. I was so completely shocked and although I wanted to reach around and tell him I was awake, I couldn’t move. I had hopes that in the darkness he didn’t see me see peak out at him moments earlier. He then whispered, “Night Madison” and he tugged off my boots and pulled a light blanket over me. He made me hesitate to answer him, I was definitely hungry for him. “I think I could eat something.” My stomach was excited and jumping inside just from seeing him so relaxed and cooking. “What’s vibrating?” I was too focused on his body and didn’t hear his words. “Oh, okay that’s what was vibrating.” I was still watching his body in motion, and was thinking of how I would like him to make me stir. He caught me staring at him and I looked away and then I remembered I had silenced my phone during their practice and then powered it up when we walked over to the house. I had to pull myself together so I went to retrieve my phone and I looked at all the missed messages, they were from Jillian. I hollered back, “Rand, I just need a few minutes to check my messages.” I went into his main front room and dialed her back. “Where the hell are you?” Jillian yelled. She was so worried that I hadn’t called her and she stopped by my place having her own key and I was no where to be found. It took some effort to calm her but I told her briefly what had happened since the concert. “I’ll agree only on one condition, I want every single detail, don’t leave anything out, I want all of them!” I had to put my hand over the phone as she said this. She was so loud and I hoped Rand did not hear any of this. “Hey, I should go, I don’t want to be rude, he is making me breakfast,” I whispered to her. Author that has the passion for putting her pen and ideas to paper. A pure romance junkie and she loves to tell stories. She was an English Major of LaSalle University and always wanted to be a writer. In the past years her books titled – From the Vine (a collection of writings/poems) and Cody and the Pumpkin Truck (a Childrens’ Book) were published. She has also written many other childrens’ stories, lyrics, articles and wedding ceremonies. 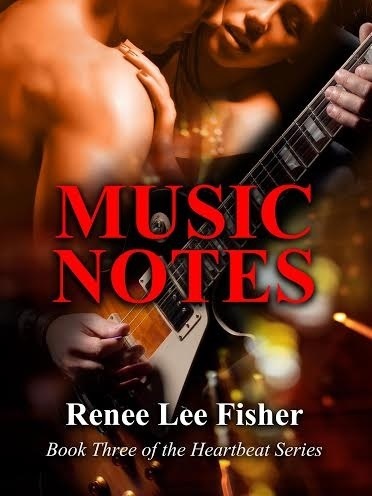 Currently she is deep into her Heartbeat Series of Contemporary Romance Novels which are titled – ROCK NOTES, LOVE NOTES, MUSIC NOTES, FIRST BEAT, FIRST BASS and FIRST TASTE. Renee resides in Eagleville, PA. with her husband Michael, of many years and her two cats – Nyah and Cody. She has a great support system of Love from her family and friends. Renee loves to travel, especially to St. Martin – Netherland Antilles. She enjoys meeting new people to inspire her and she will always write down a person’s name that is unique to use as a potential character in her future writings.